"Mr Nelson's System of Simplified Regency Dance"
The scholars companion : containing a choice collection of cotillons & country-dances / by M.J.C. Fraisier. This contains choreography for a wide variety of cotillions and country dances of the late 19th Century. The book was published in the United States, and has dances from England and France. This book was downloaded from the Library of Congress Website, where it is presented a page at a time. I have compiled it into a single PDF to facilitate printing and sharing. 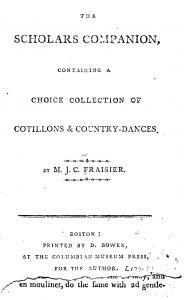 Although the title of this manual would indicate a collection of cotillons (figure dances usually performed by four couples), the dances are, in fact, English country dances, performed by a column of men facing a column of women. The collection includes directions for fifty English country dances.